You can't see me right? I would love to sleep all day too! I always complain when I have to go to work, just like your Savie. She looks so comfortable nestled in those blankets, I can see why she doesn't want to leave! 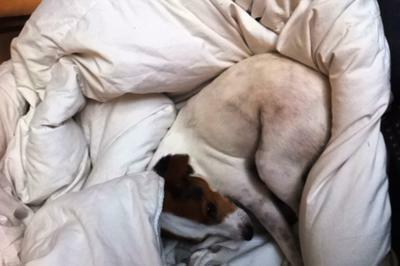 We can relate to your JRT complaining when he / she has to get out of the warm blankets. At any given time of the day or night, if our little Buddy is laying under the blankets all warm and cozy like, he will start to growl as soon as we go near him. Of course we set him straight and make sure he knows that's bad. He still complains quite loudly sometimes, trying to detour us from disturbing him, I am sure...It doesn't work though. We are very persistant with him, and what is best with our life style. We make certain he still knows his place in our world. It is our bed or couch, Not his. He is just lucky enough not to be laying on the cold wood floors, right? He is a very good boy, except for when he is sleepy, and doesn't want to be disturbed. Spoiled Brat ! That's our fault. Your Savie is SOOO cute! !